Create With Me: Do You Zentangle?? 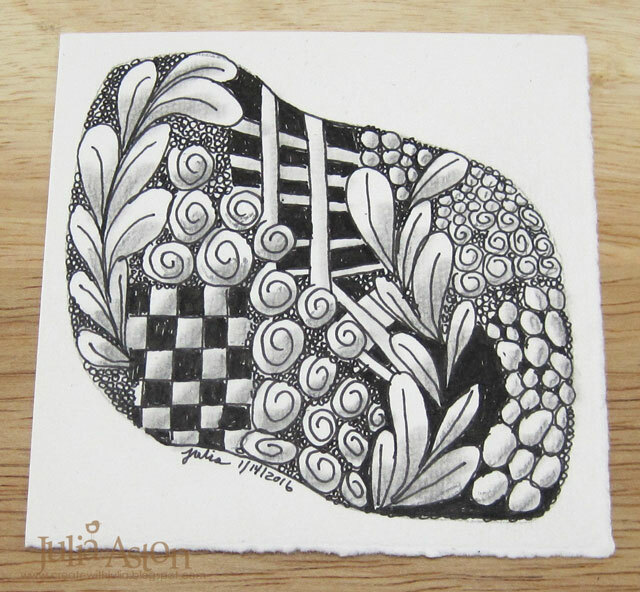 I love Zentangle - every time I see it somewhere I am totally enthralled with the 3D look you can achieve with lines, shapes, and a 01 Micron black pen! Up until recently - I had only tried it once - back in 2010 I did one for a challenge on Splitcoaststampers seen here. 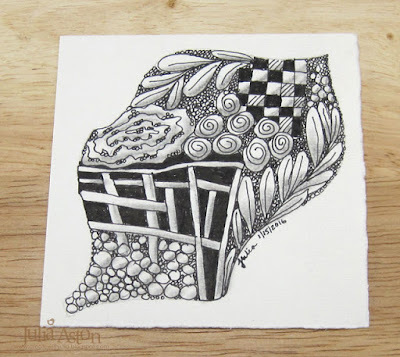 Fast forward to January 2016 when the Wanderlust classes started (see my side bar for link) - and before the actual classes started - they posted a wonderful video by Beckah Krahula called Zentangle 101. Each design shape is called a 'tangle' and Beckah showed us several that I have used on my Zentangles. Tipple - the circles on the bottom area, Hallibaugh - the stick shapes above the Tipple, A Maze Meandering Line on the left above the Hallibaugh, Printemps Closed Coil to the right of the maze, Knights Bridge that looks like a checkerboard and Flux Tangle that looks like a leaf stem. I filled the area in between the tangles either with solid black or with tiny circles. I made this first one during my lunch hour at work - and I can't tell you how excited I was when I was done - it has so much dimension IRL - the photo flattens it a bit in comparison - I hope you can feel the 3D of it a little bit. There are hundreds of Tangles - but since I'm a newbie - I just used the ones Beckah taught us! Here are two more that I made last night sitting in front of TV. You start by drawing the outside shape with a pencil. Then you just start filling in the space. I don't really have a plan when I start, I just start drawing Tangles! 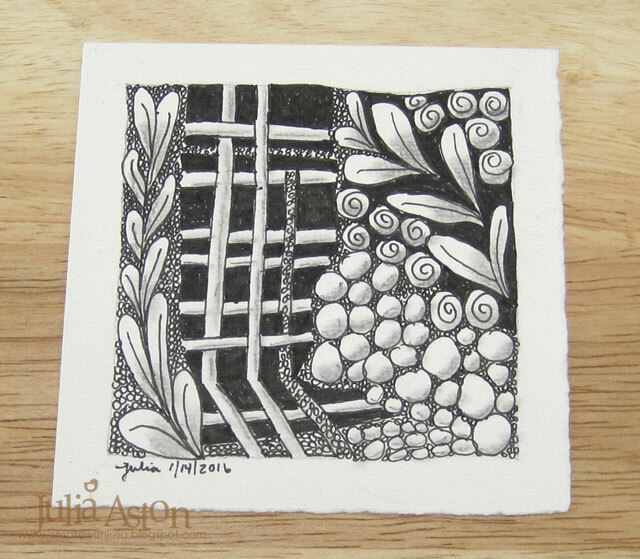 For my third Zentangle - I drew a square frame to start. When you have filled your shape with Tangles you then shade the designs with a pencil and blend the pencil lines with a paper blending stub. I'm going to layer these to black cardstock - and will look for some pretty frames to put them in. Happy weekend everyone! It's a long one for me - we have Martin Luther King day off on Monday! Fantastic zentangles Julia! You did an amazing job! This is one art form I haven't tackled as of yet! Thanks for the inspiration! I always enjoy it when I see it - and these are fabulous examples - but no, I've never Zentangled, unless you count the doodling I used to do during Economics lessons nearly 30 years ago - filling whole pages with endless tree rings inside variously shaped loops and bubbles, and then colouring in alternate rings... we didn't call it Zentangling then, that's all!